The fifth edition has been updated with new resources including case studies, tips, and terminology definitions that reflect the latest advances in GIS technology and information. The accompanying DVD includes examples and templates, exercises, and videos of the seminar “Planning and Managing a GIS” from the 2012 Esri International User Conference. Drawing from decades of Tomlinson’s consulting experience and worldwide GIS seminars, this new edition bridges the communication gap between the senior managers who oversee information technology systems and the technical specialists who design and implement the systems. The book provides a common ground for both groups so that each clearly understands the methodology needed to implement and maintain an effective GIS. Tomlinson created the first computerized geographic information system in the 1960s while working for the Canadian government. He is a former chairman of the International Geographical Union GIS Commission, a past president of the Canadian Association of Geographers, and the second-ever recipient of the prestigious Alexander Graham Bell Award from the National Geographic Society. 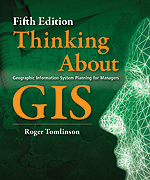 Thinking About GIS: Geographic Information System Planning for Managers, Fifth Edition (ISBN: 9781589483484, 280 pages, US$54.95), is available at online retailers worldwide, at esri.com/esripress, or by calling 1-800-447-9778. Outside the United States, visit esri.com/esripressorders for complete ordering options, or visit esri.com/distributors to contact your local Esri distributor. Interested retailers can contact Esri Press book distributor Ingram Publisher Services.